TV show dates: March 2, 2016 — April 11, 2018. Performers include: James Purefoy, Michael Kenneth Williams, Christina Hendricks, Bill Sage, Jeff Pope, Neil Sandilands, Jimmi Simpson, Pollyanna McIntosh, Tiffany Mack, Cranston Johnson, Louis Gossett Jr., Corbin Bernsen, Andrew Dice Clay, Laura Allen, Curtis Harding, and Laura Allen. Based on the novel by Joe R. Lansdale, this dark comedy/crime drama is set in the late 1980s in the fictional town of LaBorde in East Texas. It revolves around Hap and Leonard. They’re a pair of best friends who end up with a heap of trouble when a simple get-rich-quick scheme snowballs into bloody mayhem. Hap Collins (James Purefoy) is a former ’60s activist who spent time in prison after refusing to be drafted to fight in Vietnam. He’s now in his forties and down on his luck thanks to losing his job. His best friend is Leonard Pine (Michael Kenneth Williams), an openly gay black Vietnam War vet with a bad temper. He has a deeply cruel relationship with his Uncle Chester, who shunned him after learning he was gay. Trudy Fawst (Christina Hendricks) is Hap’s ex-wife — and a constant wedge between the best friends. She doesn’t hesitate to use her feminine wiles to get what she wants, all in the name of peace and free love. Filled with big dreams, Trudy resurfaces in Hap’s life with a proposition he can’t refuse — finding sunken treasure near his hometown. Hap continues to carry a torch for her and gets sucked in. Leonard has been laid off from his job and, happy to run away from his complex relationships at home, joins in..
Trudy’s latest ex-husband is Howard (Bill Sage), a man who’s seemingly a devout peace activist. During a stint in jail for damaging government property, he met a fellow inmate named Softboy McCall who told him about the stolen money that was hidden and lost in the Sabine River. Now released from prison, Howard has made it his mission to find the sunken treasure and use it for the greater good. A member of Howard’s hippie gang, Chub (Jeff Pope) is a fat, shaggy-haired former rich kid from Houston whose parents disowned him. With his liberal outlook and recklessly big heart, Chub often rubs people the wrong way. Paco (Neil Sandilands) is a former ’60s radical leader who was once wanted by the FBI. Thought to be dead from an explosion that left him disfigured, he joins Howard’s cause. Unpredictable and violent, local drug dealer Soldier (Jimmi Simpson) is a mysterious and volatile presence. His girlfriend and partner in crime is Angel (Pollyanna McIntosh), a woman’s who’s as deadly as she looks. What do you think? Do you like the Hap and Leonard TV show? Should it have been cancelled or renewed for season four on SundanceTV? 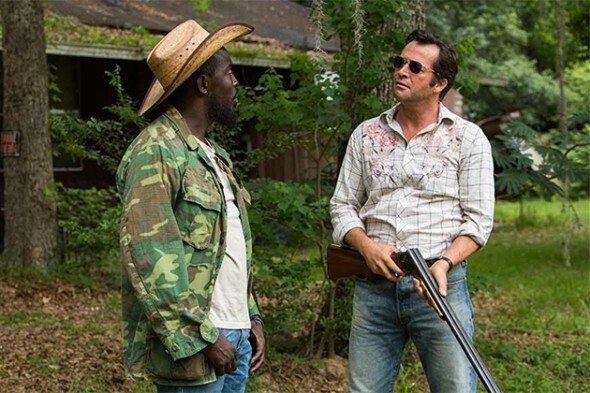 More about: Hap and Leonard, Hap and Leonard: canceled or renewed?, Hap and Leonard: ratings, SundanceTV TV shows: canceled or renewed? Please, please renew this show! My partner and I absolutely LOVED this show!